Santa Cruz de la Sierra (Agenzia Fides) - Santa Cruz is one of the nine departments that make up Bolivia. Situated in the eastern part of the country, it is the largest and most populated, occupying a third of the Bolivian territory. The region has had the highest rate of economic growth in the country in the last 50 years. The capital of the department, Santa Cruz de la Sierra, owes its name to the Spanish conqueror who founded it in 1561, Ñuflo de Chaves or Ñuflo de Chávez (1518-1568), who was born precisely in the Spanish town of Santa Cruz de la Sierra, in Extremadura. The Archdiocese of Santa Cruz de la Sierra was founded on 5 July 1605. It currently has 2,580,000 inhabitants, of whom 2,033,000 are Catholics. There are 83 parishes, 42 diocesan priests and 136 religious ones, 192 non-religious priests and 487 nuns. The Church manages 393 educational institutions and 72 assistance and charitable organizations. The "missionary Cross", which was brought on pilgrimage to the various communities of America to support the preparation for CAM 5 and which is in the CAM logo, wants to remember "the redemption and triumph of Jesus Christ over evil", the flowers that adorn it represent "the new life that springs from the glorious cross of Christ", the monogram IHS (Jesus hominum salvator) and the nails are at the center, which testify the martyrdom of Jesus on the cross. The ascending spiral indicates the growth of the mission, which gains momentum from the cross and bears witness to the missionary's commitment, willing to give its life as Christ gave it. At the base of the missionary cross is a relic of the Blessed Nazaria Ignacia March Mesa (1889-1943), founder of the first religious congregation born in Bolivia. Nazaria Ignacia was born in Madrid, Spain, and at the time of her first Communion she felt the call of the Lord. The family, for economic reasons, moved to Mexico, and there she entered the community of Hermanitas de los Ancianos Desamparados nuns, dedicating herself to charitable works especially for the elderly. During the spiritual exercises of 1920, she felt the desire to work with all her strength for the union and extension of the kingdom of God, under the banner of the cross, making "a crusade of love around the Church". On 16 June 1925 Nazaria gave life to the new congregation with ten young Bolivians. 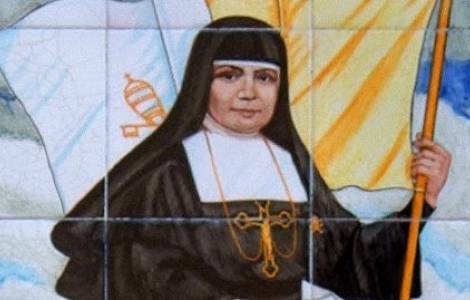 On 12 February 1927 the religious Congregation of the "Pontifical las Hermanas Misioneras de la Cruzada" was canonically erected and on 9 June 1947, when Nazaria Ignacia had already died, the Institute had the pontifical and the name "Misioneras Cruzadas de la Iglesia" approval. As Mother Nazaria Ignacia said, "to love, to obey, to cooperate with the Church through her work of preaching the Gospel to every creature is our life ... love above all for Christ and in Christ. To share with the poor, teach the children of the people, share the bread with them, and finally give all their life, for Christ, for the Church, for the souls". Nazaria Ignacia died in Buenos Aires (Argentina) on July 6, 1943, in the name of sanctity. Her mortal remains were transferred to Oruro (Bolivia) in 1972, respecting her will. She was beatified by Pope John Paul II in Rome on 27 September 1992.